Ford is done making cars that aren’t the Focus Active and Mustang but claims it will still have affordable vehicles for the masses. To that end, we get the 2018 Ford EcoSport: a one-liter micro SUV shipped from international markets to try and capitalize on America’s lust for tall-looking vehicles and low lease payments. The EcoSport, pronounced “Echo Sport,” or “Ecco Sport” if you are an Ecco the Dolphin fan, has a starting list price that’s just a hair under $20,000, seating for four (technically five, but, no) and the same basic proportions as every other crossover that’s selling like umbrellas and alligator-themed anything in a south Florida souvenir shop. That means you’re probably going to start seeing a lot of them on the road. And that puts a lot of pressure on me, since I am a Video Producer and not a Reviews Editor. But not to worry, potential Ford EcoSport purchaser and/or casual Jalopnik reader, I am here for you! And also our actual Reviews Editor Andrew Collins has helped me write this. When I told our EIC Patrick George that I was going to drive the new-to-U.S. EcoSport, he looked at me and offered–“I am so sorry that we are having you drive that car” somewhat ominously. Well, I figured out what he meant. Ford is insisting on marketing the EcoSport as the “first ever” of its kind but the plucky little car has been for sale in China, Brazil, India and Europe for years. Here in America it will be sold in a few flavors: front-wheel drive base models with a 1.0-liter turbocharged engine and two better-equipped variants with a 2.0-liter naturally aspirated power plant and automatic 4WD. You’ll be able to mix and match attributes, too: our test car was the medium-fancy Titanium trim with the smaller EcoBoost (here pronounced “E-Co”) engine and FWD. The Titanium trim unlocks an audio system upgrade, Ford’s SYNC 3 infotainment software with navigation, leather-trimmed seats and a power moonroof. Even with all those toys, the list price is still a pretty modest $23,325. Most of you reading this will probably already understand that 1.0 liters, uh, liter, is not a lot of displacement for an engine to make power in. So with that in mind, the fact that this tiny turbocharged engine is rated to excrete 123 horsepower is pretty freaking impressive. The car’s curb weight of about 3,100 pounds is lean for a crossover, too. I know I said that the proportions are standard-crossover, by the dimensions are pretty miniscule. At just 161 inches bumper to bumper, the EcoSport is shorter than the original Toyota Rav4. And yet, the power to weight ratio still isn’t efficient enough to yield anything resembling spirited acceleration. 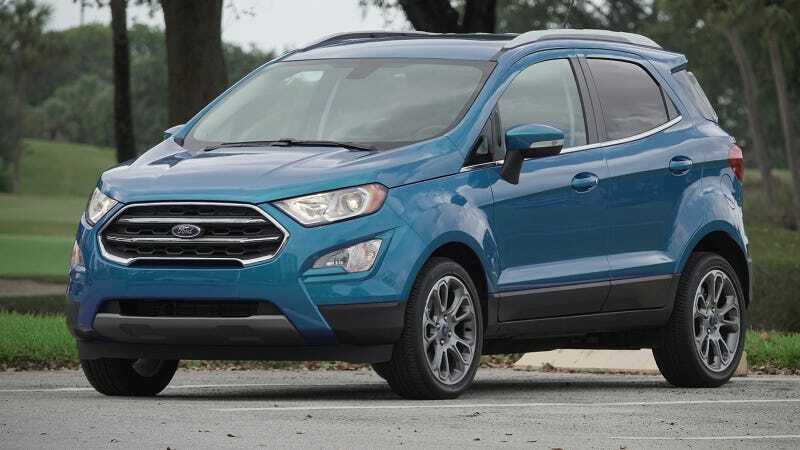 While my wife and I were cruising around the mean streets of Boca Raton, I had plenty of occasions to put my foot to the floor in an effort to escape the dangerous insanity of that city’s local drivers but alas, the EcoSport could barely be bothered to increase its speed. I mean, I put my foot to the ground and I had to squint at the speedometer to confirm that the needle was moving up. Despite the lack of acceleration, the drive experience was mostly fine. The steering and handling are adequately responsive, and stopping power seemed equally acceptable. You won’t be surprised to learn that the EcoSport is not exactly a performance standout, but with the exception of its weak acceleration, the vehicle’s sufficiently competent for urban driving. Perhaps more importantly–the EcoSport’s tiny footprint makes it easy to park pretty much anywhere. My wife is a big personality in a small package. She is about 5-foot 4-inches and told me that the passenger’s seat was quite comfortable. Then again she’s used to dealing with the E train out to Jamaica, that’s Queens not the Caribbean island, so she’d probably be happy sitting in anything that didn’t have a funky smell next to her. My parents, on the other hand, are more accustomed to the luxury of car ownership, as they get around in their very own 2016 Toyota Prius. They did not reach out to me before purchasing one, as I would have possibly suggested a Toyota Sera instead (their loss). I took my parents and wife to dinner and with the EcoSport almost fully laden with humans, I harassed my parents in the back seat about how it felt. My mother chimed “Roomy, comfortable, not bad.” I knew from that one line that this was going to be an awesome review. I looked back, and also realized that Ford had optimized its back seat for three much smaller, or at least younger, people to sit side-by-side. To put it delicately–there’s no way you could fit three average sized grown people in the back seat of this car. My parents are not large people at all, and they were very close together. While you can actually fit four people comfortably, the cargo space in the back is quite lacking. Ford promises that there’s just under 21 cubic feet of cargo space behind the back seat. For your reference, a Honda Civic has about 15 cubic feet in its trunk and the Ford Focus, which will of course soon be dead to America, has about 23.3 cubic feet in its cargo area. Practically speaking, I think the EcoSport would probably hold two medium sized rolling luggage cases and that’s about it. Dropping the rear seat more than doubles your carrying capacity to about 50 cubic feet, but then you’re down to a two-passenger limit. Despite the sad news that Ford’s small car catalog is being closed, it’s even sadder that this is the new normal for what “compact car” means to this company. I’m not trying to say that the Fiesta was a pillar of Ford’s solvency... at all. (Ford reported selling 3,151 Fiestas last month, barely a blip compared to its breadwinning F-Series trucks which sold 73,104.) But at least consumers had a healthy range options for sub-$25,000 vehicles. And of course, there’s the whole part about certain versions of the Fiesta and Focus being fun to drive. It doesn’t matter that the EcoSport makes a lot of power for its engine size, it’s not even in the same universe as the Fiesta for fun factor. But I digress. The EcoSport is no ST, obviously. It’s not really much of anything besides cheap transportation–the starting list price is a super-slim $19,995 and a few seconds of Googling pointed me to ads for lease deals on these with monthly payments that were lower than the price of a New York City public transit card. If your driving desires revolve around ease of use and ease of parking, the EcoSport is viable. It is tiny and intuitive. But it’s not much else. Clarification: This story has been updated to clarify the language disclosing the loan from Ford; we asked them to give us an EcoSport, they did not force us to drive one, or anything like that.